On the beautiful Sithonia peninsula is where you will find the village of Neos Marmaras, and you will soon realize why tourism is the main industry here. 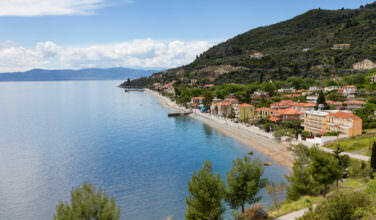 Neos Marmaras is home to two of the most picturesque beaches in all of Greece. The first beach we’re going to talk about is Lagomandra Beach, which has some of the most gorgeously blue water you will ever see. When you come to Lagomandra Beach, it’s hard not to be captivated by the scenery around you. While you swim in the water that’s as clear as glass, take a moment to look up and take it all in. Notice the blue sky, the tree-filled hills, the golden sands and horizon that looks like it never ends. Highly regarded as one of the best beaches on Sithonia, Lagomandra Beach stretches far along the coast with the trees providing plenty of areas for shade to escape the hot Greek sun. If you’re looking to get involved in some water sports, make sure you get there early enough in the morning, because the spots get taken up really quick. And while Lagomandra Beach sounds like a little piece of heaven — which it is — the number one beach that tourists frequent in Neos Marmaras is Kohi Beach. This beach is loaded with sunbeds and umbrellas. The ocean floor is kind of rocky, so I would suggest bringing water shoes if you have a pair. Beachgoers here have raved about the beach bar, the quality of the drinks they serve, as well as the great prices. There is usually music playing at Kohi Beach, but more often than not they will be playing very relaxing music. One of the best parts about this beach is that it doesn’t get terribly crowded, even during the peak of Greece’s tourism season. But the area is so beautiful that you can’t just devote all your time to being a beach bum. You’re missing out if you don’t get out and see the peninsula from out on the water, and you can do that with CharterAyacht Day Tours. I can just about guarantee that sailing along the coastline of Halkidiki will be one of the most memorable, if not the most memorable, experiences of your entire trip. The cruise is worth it just for all of the amazing sights that you will get to see. But the crew who runs the day tours are some of the most well informed folks around, and they love sharing their wealth of knowledge. And if Charter A Yacht Day Tours didn’t completely scratch your adventure itch, then maybe the Poseidon Diving Academy will! If you have never been diving before, it is an unforgettable experience that, for some, is a once in a lifetime experience. 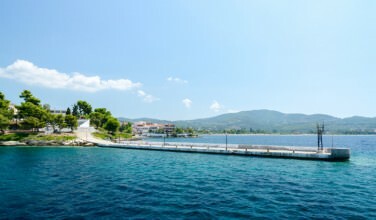 The Poseidon Diving Academy will prepare you so that you can partake in the safest and most exciting dive possible, as they know all of the great dive spots off the coast of Neos Marmaras. 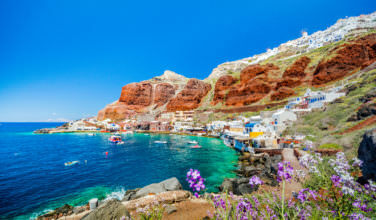 The best part is that a lot of visitors come to the Poseidon Diving Academy thinking that they are only going to do one dive, just to try it out, and then they end up coming back every single day of their vacation and go on several dives a day. Give it a shot, and I promise you won’t regret it!